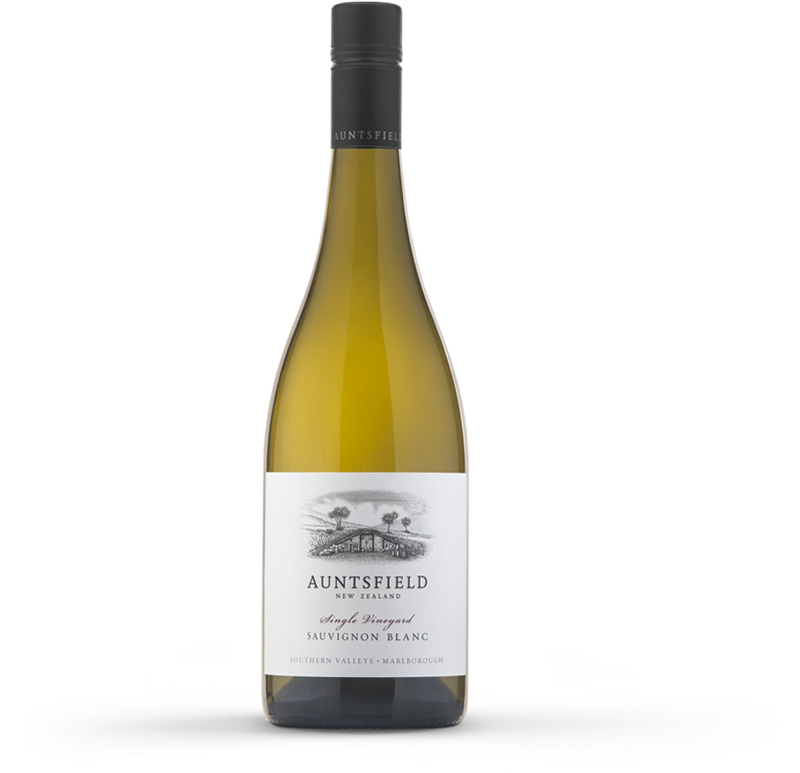 Sauvignon Blanc – Auntsfield Estate aims to produce a distinctive style of Sauvignon Blanc. The style is aimed towards texture, complexity and length, balancing the typical Marlborough fruit spectrum and aromatics with richness and mouth feel. PALATE: Powerful, tight and elegant. This wine displays intense ripe fruit flavours of passionfruit and white peach, with citrus notes of lime and mandarin pith. The palate has intense concentration and generous weight, balanced by an underlying minerality and tight structure to shape a wine with lively tension and textural balance. the bright fresh fruit characters with an underlying minerality and fine structure. vigilance, open canopies and fruit that ripened before the Autumn rains. AROMA: Lifted and pure aromas of passionfruit, ripe citrus and lime leaf. Notes of fresh and dried herbs, gooseberry and redcurrant add pungency and intensity to the aromatics. PALATE: Powerful, tight and elegant. This wine displays intense ripe fruit flavours of passionfruit juice and white peach, with citrus notes of lime and mandarin pith. The palate has intense concentration and generous weight, balanced by an underlying minerality and tight structure to shape a wine with lively tension and textural balance. Cool fermentation with cultured yeast in stainless steel tanks was utilised to retain the fresh varietal aromatics. This was balanced by a portion of the fruit subjected to traditional winemaking practices; handpicked, whole bunch pressed and fermented in seasoned oak barrels, adding texture and length to the wine. The result is a hand-crafted wine combining the bright fresh fruit characters with an underlying minerality and fine structure. The 2017 season was characterised by a cold spring and cool growing season, resulting in low natural cropping levels. A long Autumn produced excellent conditions, allowing the fruit to ripen over an extended period of time providing clean fruit that looked exceptionally bright and vibrant. A season that rewarded vigilance, lower cropping levels and an earlier ripening period before any late Autumn rain. AROMA: Lifted and pure aromas of fresh passionfruit, ripe citrus and lime. Notes of dried herbs, lemongrass, jalapeno and blackcurrant add pungency and intensity to the aromatics. Cool fermentation with cultured yeast in stainless steel tanks was utilised to retain the fresh varietal aromatics. This was balanced by a portion of the fruit subjected to traditional winemaking practices; handpicked, whole bunch pressed and fermented in seasoned oak barrels, adding texture and length to the wine. The result is a hand crafted wine combining the bright fresh fruit characters with an underlying minerality and fine structure. The 2016 season was characterised by naturally high yields resulting from rainfall at key growth stages. A very dry summer followed with vineyard work focused around reduced yields by hand to optimal levels. This allowed the fruit to ripen over an extended period of time in the cool and settled conditions of early autumn. A season that rewarded vigilance, lower cropping levels and delayed ripening in the vineyard. Seductive and alluring bouquet of SB with softer fruit spice layers woven between suggestions of lemon and sweet grapefruit, apple, mineral and fresh lychee. Crisp, dry, packed with flavour and texture. Notable acidity well balanced against the ripeness of fruit and gentle fruit spice moments. Lengthy and quite complex finish. Drink now through 2022. (Single Vineyard Sauvignon Blanc 2018). Five Stars. MICHAEL COOPER. November, 2018. Very pale straw colour. The nose is soft with ripe, passionfruity aromas and gentle density. This has lovely harmony. Medium-bodied, the ripe passionfruit flavours are softly presented, and the palate is composed of fine phenolic textures with bright acidity. The integration, balance and togetherness is gorgeous. Luc Cowley reported that 2018 wasn’t an easy vintage, but lessons learnt from 2017 were invaluable. (2018 Single Vineyard Sauvignon Blanc). 1 of 67 wines selected for the exclusive Fine Wines of New Zealand List, compiled by leading wine experts to showcase New Zealand wines that go above and beyond in displaying consistent quality and distinction. (Single Vineyard Sauvignon Blanc 2017). A weighty wine with quite intense red capsicum, gooseberry and nectarine flavours. It’s also showing impressive purity and length. Drinking Window 2017 – 2024. (Single Vineyard Sauvignon Blanc 2016). Beautifully poised and extravagant, with Sauvignon personality; grass, gooseberry and elderflower, crunchy acid and good length. Yum! Drinking Window 2017 – 2024. (Single Vineyard Sauvignon Blanc 2016). Classic mix of fresh and dried herbs fine citrus and tropical passionfruit and peach hints. Balanced and fresh, lively and lengthy, a nice wine overall. Drinking Window 2017 – 2024. (Single Vineyard Sauvignon Blanc 2016).